It is only on our third day in France, at around 7 in the evening, that I finally understand what this light is all about. Awash in a golden glow, everything looks exaggerated including the color of the soil. It’s as if a painter had taken his paintbrush and let the bristles kiss the tops of the lavender fields in Provence, touching just the tips of the flowers with color, and then dipping it in his paint again and brushing the fields one more time, or perhaps even thrice. The soil is now reddish brown, the lavender flowers brighter and deeper in color, and in the distance a tree beside a farmhouse looks greener. It’s what the painters call “the clarity of light” and the famous ones all passed through this region of Southern France at different periods, for different reasons and lengths of time—Van Gogh, Cezanne, Matisse, Renoir and Picasso. 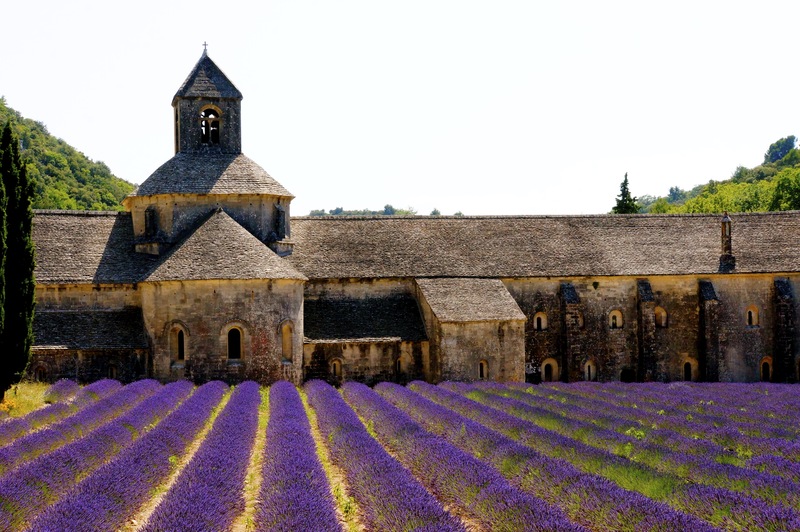 Often the first stop, the Notre Dame de Sénanque Abbey in Gordes is the gateway to lavender country in Provence. Photo by Steve Villacin. Van Gogh was perhaps the most famous to set up his easel in Provence. He stayed here for two years and the paintings he did here were the ones that made him famous after his death, including “Starry Night.” He painted feverishly in Arles and perhaps even more intensely in his year at the asylum of St. Remy de Provence. I am standing in the same light on these fields in the village of Valensole, staring at a farmhouse with a tree beside it. I have never been here before but this dreamy scene looks so familiar, as if I were looking at myself looking at the tree, as if I were observing the whole scene out of my own body. Then I realize that a cursory search of “lavender fields in Provence” will most likely turn up Valensole, along with the Notre-Dame de Sénanque Abbey in Gordes. 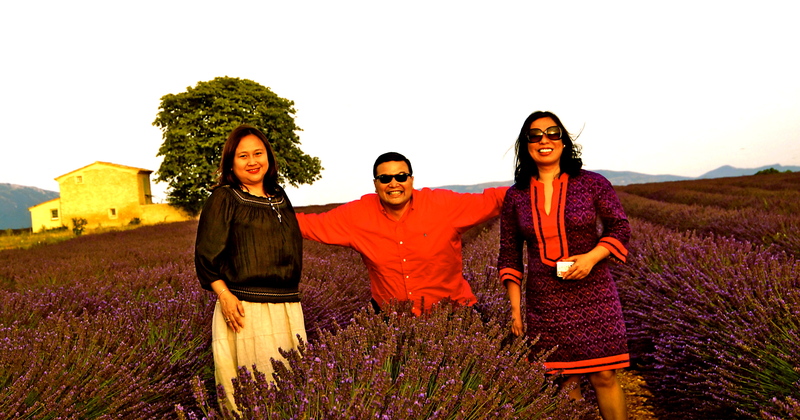 Had we arrived three days later, we would have completely missed these gorgeous lavender fields. Here they are being harvested and will soon be on their way to distilleries to be turned into perfumes and toiletries. We could have easily missed the peak of the lavender blooms had we arrived a week earlier or missed them entirely if we arrived three days later as they were going to be harvested on the weekend. We arrived just in time in Paris several days before—on the morning, in fact, that a plane from the same airline we took was shot down over Ukraine. 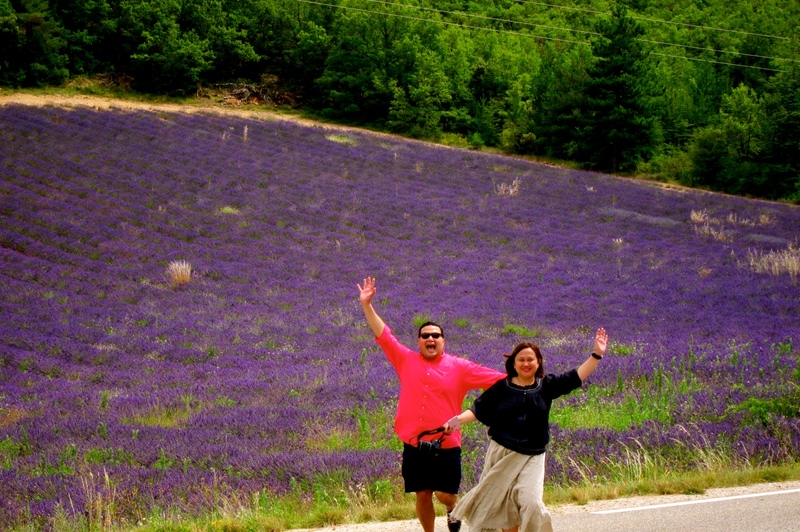 After taking the train to Avignon the next day my friends—CV Travel & Tours Corporation managing director Claudette Vitug and chef Steve Villacin— and I began our road trip through Provence. As far as you can see are rows and rows of lavender and the fields are “clean” or without wild grass around them. If you stand south of it, you will some fields have already been harvested with only the shrubs left behind, and the flowers are already on their way to the many distilleries in the region, their essence to be infused into toiletries such as perfumes, soaps, shower gels, lotions, and even in food like tea, honey, macarons, breads and biscotti. And yet there are hardly people here on the Valensole plateau. In Banon and Manosque, you can spot tourist buses parked on the side of the roads with visitors (mostly from Mainland China) stopping by to take pictures deep into the fields. A week before, Claudette had sent me a link to a story about two Chinese brides getting into a hair-pulling fight because they were photobombing each other’s pre-nuptial pictorial. We decided to skip this field. Our discovery of these fields in Valensole was by serendipity. We were on our way to Moustiers Sainte-Marie, a town in the Alpes-de-Haute-Provence, when we saw the farmhouse. In Moustiers, a town that is seemingly wedged between gorges, we take a walk around after a late lunch. It is a quiet place that specializes in ceramics and outdoor sports. Tourist shops offer white-water rafting, hiking, and mountain climbing. So after Moustiers, we drive back to the plateau. Tanya Lara, Claudette Vitug and Steve Villacin in this dreamy scene of a lavender field with a farmhouse and a tree in Valensole—breathtaking at sunset. The night before, I was on Skype with my friend Gautier Le Sann, a Frenchman originally from the north of France and now living in Prague, and I told him we were going to the plateau the next day. It’s not only me that experienced this. Even Claudette and Stevie were asked the same thing by their French friends. 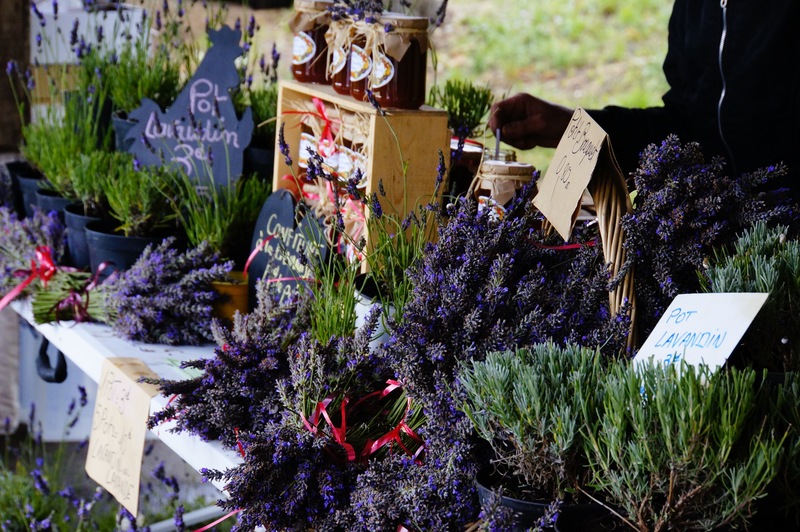 It seems to confuse French people— especially those from Paris or those not from Southern France—that people would take the trouble to cross the Atlantic Ocean to look at lavender flowers. It was so ordinary to them, these fields—as ordinary as our green rice fields are to us. From Moustiers, we get back to Valensole at sunset. There is no one else around. In this most gorgeous of hours, in this wildly colorful swath of land, I want to tell Gautier: This is why. The easiest way to go to Provence is to take the train from Gare de Lyon in Paris to Avignon, a two-and-half-hour journey. 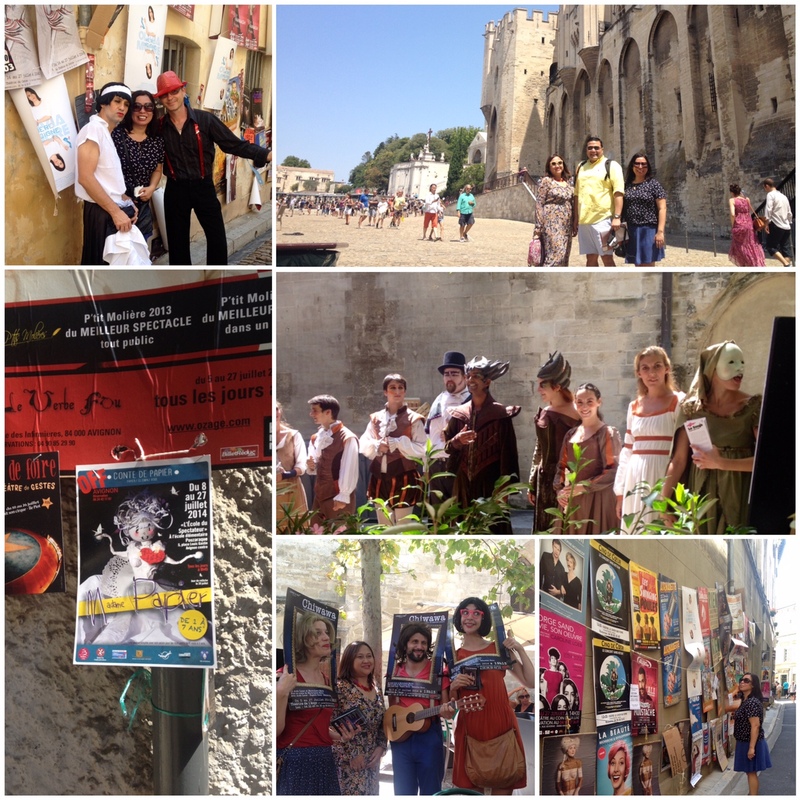 Avignon itself is a lovely town with a bustling art scene. We happened to catch the theater festival for the summer, so the Medieval walls of the center are literally plastered with posters promoting more than a hundred plays, musicals and shows. There are contemporary plays alongside the classics by Shakespeare, Moliére and Camus, but unfortunately, everything is in French. 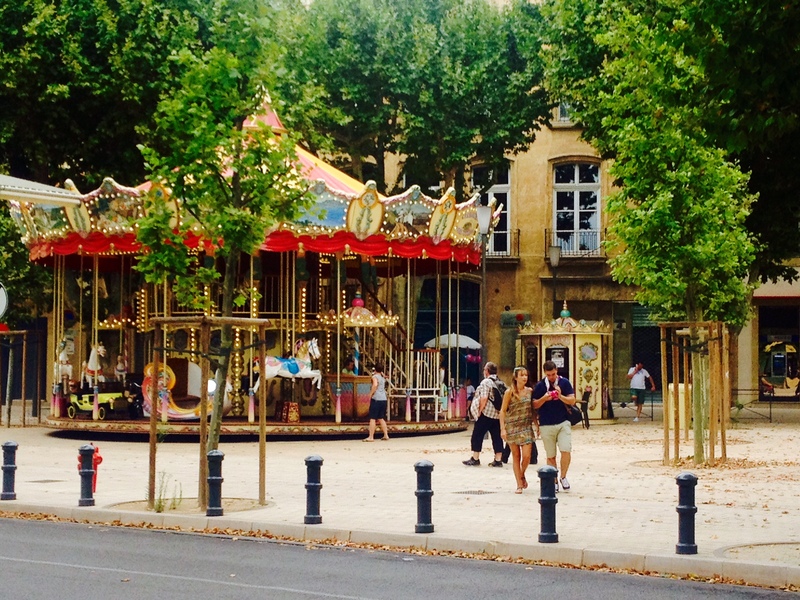 July is a lively time to be in Avignon. The actors perform on the streets in full costume, entertaining visitors having lunch, or just positioning themselves in alleys or outside the medieval ramparts. The shops are all open, selling souvenirs, colorful jewelry pieces made by local artists, and summer clothing. As lively as it is today, it was home to seven successive Popes during the Avignon Papacy hundreds of years ago, hence the center includes the Palace of the Popes, the cathedral and the Pont d’Avignon or Avignon Bridge. From Avignon, go east to the Notre-Dame de Sénanque Abbey in Gordes. The abbey is usually the first stop for people chasing lavender. It is a community of Cistercian monks that have opened their fields to the public for free. A tour inside the abbey needs to be booked online (again it’s only in French) as it is scheduled every hour and for a fee. Even if you understand very little of the language or none at all, it’s still interesting to see the architecture inside and to know the Cistercian way of life. The Cistercian monasteries across Europe were founded 900 years ago starting in Burgundy and were situated in remote places. The Sénanque Abbey is located at the bottom of the valley in Gordes for this reason and it is ironic that today it is one of the most popular tourist attractions in Provence. The monks are secluded in their dormitory and go about their life of continual prayer, beginning at 2 a.m. when they do their first religious ceremony of the day. The Abbey does offer residential retreats to the public (except in January and February, and for a maximum of only eight days) for a modest fee and guests take their meals with the monks (eaten in silence because they follow St. Benedict’s vows). 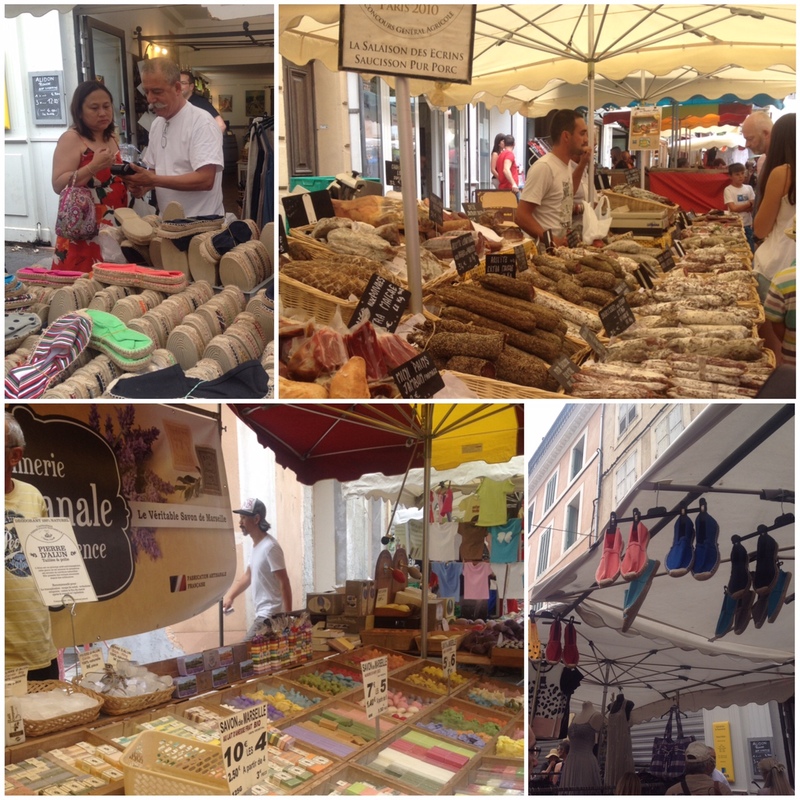 Further east of Gordes is the town of Apt, whose open market is the biggest of the Luberon markets and has been ongoing for hundreds of years. It offers food, local products, clothes, gorgeous tablecloths, flowers, toiletries, and many other things. Here we buy all sorts of things: paella, espadrilles, hats, spices and saucissons. 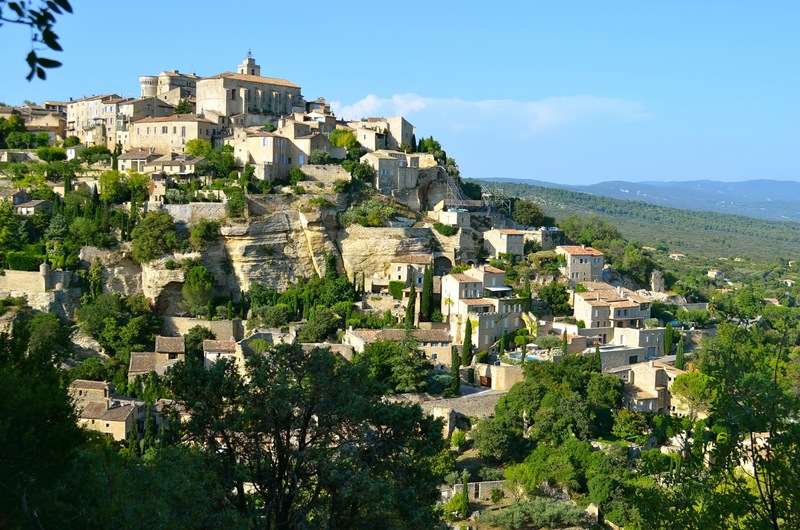 From Apt, our next destination is Banon, and we discover it is going to host the Tour de France on the same day we are planning to join the Lavender Festival in Valensole. It is an easy choice for us. We came for lavender, this beautiful, fragrant plant of 39 species. But it isn’t the only flower here. 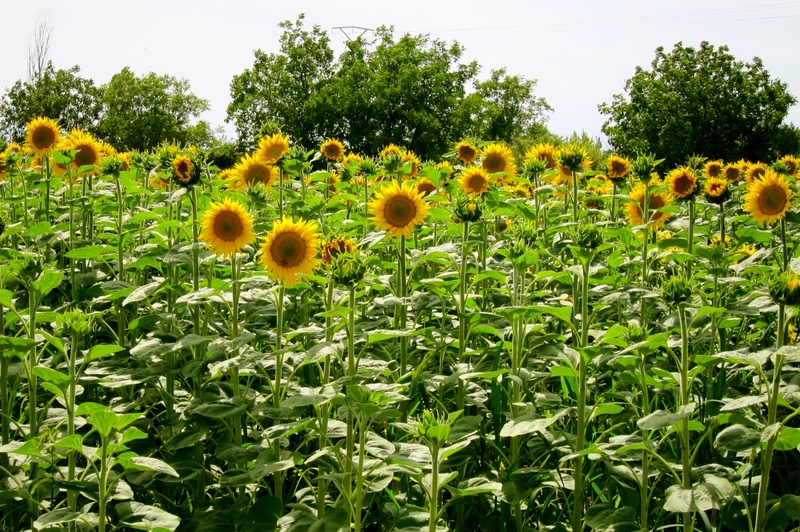 Sometimes we spot a field of sunflowers, as tall as people, the flowers facing the sun and, in places where it is overcast, they are bowed as if in shame. It is raining when we get to the Valensole festival on a Sunday morning. “Lá-bas,” we are told. Over there. We walk from the muddy parking lot to the small buses that take people to the town center where the streets are closed to vehicular traffic. Everyone in this town and its surrounding areas, it seems, is out selling lavender-infused goods. 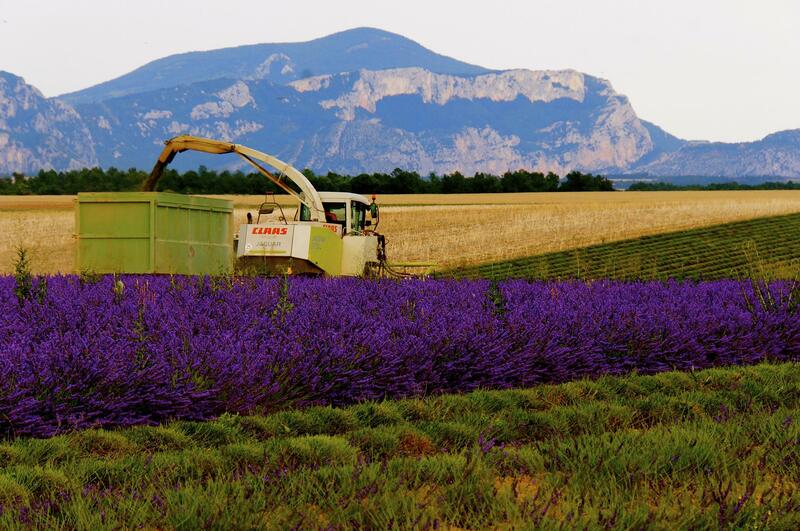 We say goodbye to Provence one lavender stalk at a time. On the same day as the lavender festival, the Tour de France was passing through these parts. The decision on which one to see was an easy one. Photo by Steve Villacin. They are giving out stalks of lavandine for free. We rub the flowers between our hands and inhale. They smell wonderful, the whole place smells wonderful. There are other places we visit after the festival, such as Manosque, Aix-en Provence, Les Baux de Provence (where we see a wonderful light production of Gustav Klimt’s art) and Marseilles, before returning to Paris. But every place after the festival—our hotel rooms, our rented car, the restaurants—we leave behind by accident small clusters of flowers on the floor, which have fallen off from the stalks they gave us in Valensole. 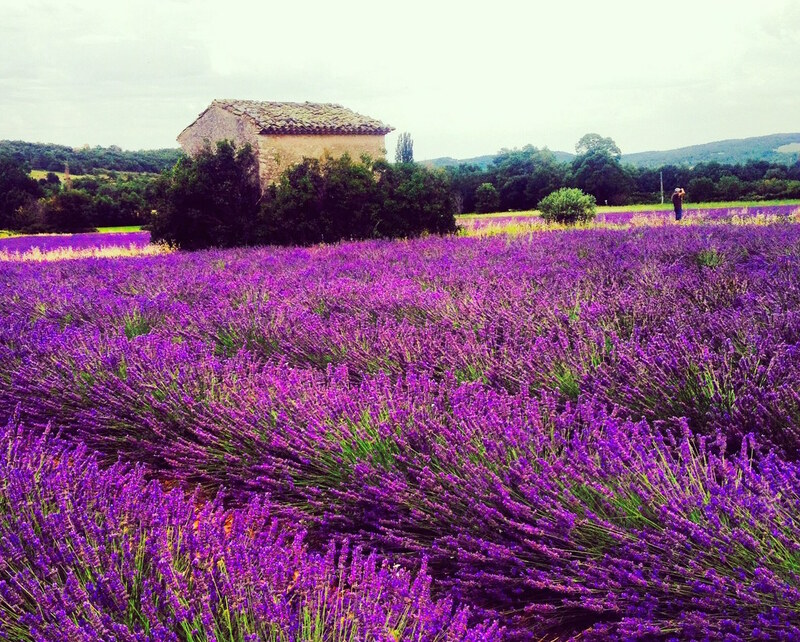 It’s as if Provence is saying goodbye to us slowly, one lavender flower at a time. Or maybe it’s us saying goodbye to Provence. Atchi, where are you now? I can’t catch up with you. Beautifully written Ms. Tanya. I’ve read many articles and seen thousands of photos of the lavander fields in France but they enticed me to plan a trip there (for fear of buses of tourists). This might be the only article that convinced me. Thank you for a very vivid narration. It is as if i just took a nap and woke up yo a sea of lavanders and reading your story just made mè appreciate it more. It was so vivid. The visuals were just so crisp and crystal. One day i will visit Provence and i will remembed you Tanya. One July in my lifetime i will stop to smell the lavenders and think how you enjoyed and shared to the world the highs your soul experienced in that placw. Fantastic place it must be. Will see you around my friend. Thank you for sharing your story. Of course with claudettw and stevie too. It is as if i just took a nap and woke up yo a sea of lavanders and reading your story just made mè appreciate it more. It was so vivid. The visuals were just so crisp and crystal. One day i will visit Provence and i will remember you Tanya. One July in my lifetime i will stop to smell the lavenders and think how you enjoyed and shared to the world the highs your soul experienced in that placw. Fantastic place it must be. Will see you around my friend. Thank you for sharing your story. Of course with claudettw and stevie too. It is as if i just took a nap and woke up to a sea of lavanders and reading your story just made mè appreciate it more. It was so vivid. The visuals were just so crisp and crystal. One day i will visit Provence and i will remember you Tanya. One July in my lifetime i will stop to smell the lavenders and think of how you enjoyed and shared to the world the highs your soul experienced in that place. Fantastic place it must be. Will see you around my friend. Thank you for sharing your story. Of course with claudette and stevie too.